Profitable trading and investing comes down to two groups, those who know what they are doing (banks and financial institutions) and those who don’t (average traders and investors). In the trading and investing world, those who know what they are doing simply get paid from those who don’t. This is no surprise as banks and financial institutions are very educated in the financial markets, average traders and investors are not. I began my career on the trading floor of the Chicago Mercantile Exchange on the bank side of the business, so I learned what the smart money does and how the smart money thinks. When it comes to consistent profits for the short-term income trader or longer-term investor, there are only two questions that matter. Where will price move to? Most people think you can’t predict market turns and market moves in advance. I say you can, and with a very high degree of accuracy. Let me explain. Let’s start by simply answering the two questions and see what this looks like on a price chart. Once we do, we can apply this strategy to any market, whether investing in stocks, bonds, futures, forex, options, bitcoin, real estate, etc., and for any financial purpose (short-term income trading, long term investing for wealth, asset protection, retirement planning, etc.). How do you tell where will price turn? Market price turns at price levels where supply and demand are out of balance. Banks and financial institutions are consistently very profitable, and they create the largest imbalances as they buy and sell the largest quantities. So, if we can see where they are buying and selling on a price chart, we can buy and sell there also. Here is what that looks like. During a recent live trading session in one of our live trading rooms, we identified a buying opportunity in Gold. Looking at the chart on the left (the setup), the yellow shaded area represents demand, where banks are buying Gold. How do we know this? Price was trading for a short period of time and then rallied strong from that level. That rally can only happen because demand exceeds supply. 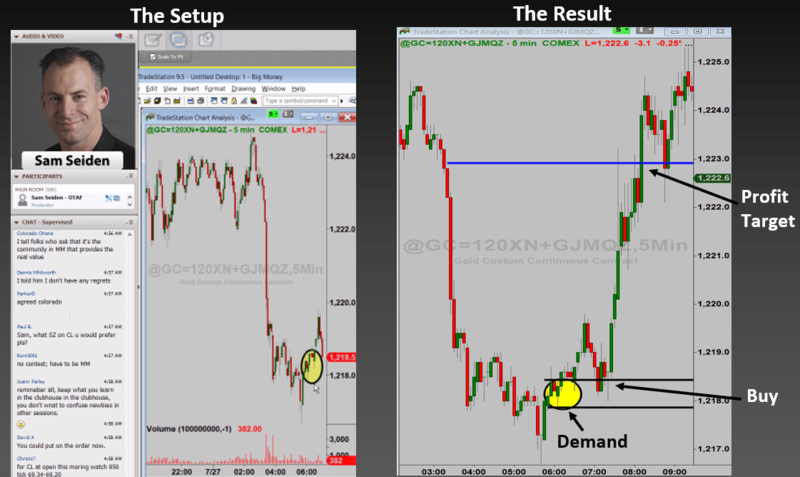 Shortly after, price declined back to that demand level, as seen clearly on the chart on the right (the result). When price revisits the demand level, we know novice traders are selling. We know this because only a novice trader or investor would sell AFTER a decline in price and AT a price level where demand exceeds supply (banks are buying). This is where we bought. How do you know where will price move to? In any and all markets, price simply moves from demand to supply and back again. Once all the buy and sell orders are filled at a demand or supply level, price simply moves to the next level. By seeing supply and demand on a price chart like we are doing here, we can predict market moves in advance with a very high degree of accuracy. Prior to deciding to take the trade and buy, we must know what the profit zone is. The profit zone is the distance from demand to supply. With supply much higher, just above the blue line, we buy at demand and sell at the blue line, our profit target. Most people never come close to achieving their financial goals because they have a faulty money mindset. Meaning, they either don’t pay attention to price when investing, or they make buy and sell decisions backwards. For example, when buying a stock, most people make sure it’s a great company with solid earnings, strong management, a healthy balance sheet and a stock price that is in a strong uptrend. Think about it… When all those things are present in the stock, where do you think the price of the stock is? It’s almost always high, at or near retail prices (supply). The problem is people fail to realize the most important simple truth when it comes to profiting in the financial markets. How you make money buying and selling as a retail business or savvy shopper is exactly how you make money buying and selling in the markets. Buy at Demand (wholesale), sell at Supply (retail). This allows you to buy and sell where banks and financial institutions are buying and selling, which helps you now achieve your financial goals which is the key to living the life you choose to live. No matter the asset class you’re investing in, learning this simple rule-based strategy and developing the skillset is the key to owning this knowledge. Attaining the proper money mindset is the key to executing the strategy successfully.